Question Is this company connected to the car maker Hyundai? AnswerIt was previously a Hyundai group subsidiary, but it is now independently operated. Question Country of origin (manufacturer), types of manufacturing factories? AnswerThe product is manufactured in Korea. It is produced at GMP and/or ISO-certified factories to ensure that our products meet the highest quality control standards in the industry. Our Vitamin C comes from an impeccable source in the UK. Question What is this (product)? AnswerIt is a vitamin C formulation that can pass through skin layers and reach the dermis. Previously marketed vitamin C products cannot provide guaranteed and measurable delivery of the active ingredient to skin’s deepest layer. Our new proprietary LDH technology provides a more effective way of deliver vitamin C deep into the skin. There are many formulas on the market, but only one, Vitabrid, will give you results you can “C” for yourself. Question Is it medicine or cosmetics? AnswerThis classification depends on the regulations in place for each country. Within the UAE/MENA it is classified as cosmetics. Question What is the difference between this product and other vitamin C products? AnswerOnly Vitabrid C12’s skincare can deliver high quality nutrients into the dermis via ion exchange, and our patented technology works for 12 hours with a single application. With 2 weeks of consistent use, you too will see amazing results from our proven formula. Question How do you deal with the waste during production? Is it harmful to the environment? AnswerVitabrid’s commitment to a harmonious relationship with our world continues throughout the manufacturing process, and is compliant with all Korean FDA regulations and statutes. Question How does it enter the skin? AnswerIt enters the skin by ion-exchange activities. As sweat and carbon dioxide leave your pores, Vitabrid CG penetrates deeply into the dermis, where it stimulates collagen productions, blocks acne causing bacteria and heals from the inside out. Question How do the effects last for 12 hours? AnswerBecause our targeted delivery system places the nutrition you need so deeply into your skin, the effects last a full 12 hours, as proven in our extensive clinical trials prior to launch. Question What is Vitabrid CG? AnswerVitabrid CG is a proprietary compounding that encloses high quality vitamins inside zinc ions, for a seamless exchange across the skin’s surface to its deepest layer for long lasting and proven results. Question What % of Vitamin C is in this product (FACE / HAIR / Shampoo)? AnswerOur face powder and hair care feature a concentration ranging between 25% and 32% per bottle. Our Complementary ingredients combine with our powerful nutrition to enhance and soothe your skin. Question Do you carry out animal testing on any of your finished products? AnswerNo, we do not carry out animal testing on our finished products. Question What effects are there? AnswerBasically, it neutralizes free-radicals (the main cause of aging) and stimulates collagen production (makes better skin appearance, with notable decreases in skin wrinkling) among other beneficial effects like reducing redness, healing blemishes and banishing age spots. Question How long does it take for FACE or SKIN products to show results? AnswerThough it does differ for the individual, FACE or SKIN products will show results as early as the next day. With 2 weeks of consistent usage, you will see more luminous and vibrant skin and thicker, fuller hair. Question Does FACE BRIGHTENING make your skin white? AnswerFACE Brightening enhances your natural complexion, and will reveal your brightest healthiest skin without removing your natural pigmentation. While it heals age spots by inactivating melanin on troubled areas, it will not significantly lighten your entire complexion. Question Does hair really grow? How long do I have to use it for the effects to show? AnswerDuring our clinical trials, the most significant results were seen in patients that had patches of hair loss that still had follicles actively growing. With continued use over a 3 month span, our patients saw up to a 64% regeneration at these areas, with thicker, fuller natural hair growth. Initial improvement occurred in as little as 1 to 2 weeks of daily scalp product application. Question How long do the effects last after discontinuing the use of the product? AnswerWhile we are sure you will never want to stop using our products once you start, you will notice that as long as you keep making healthy choices, your skin will not lose the benefits Vitabrid CG provided. Regular good skin care will maintain the deeply delivered changes our patented formula encourages. Question Is it better than vitamin C supplement tablets if taken by mouth? 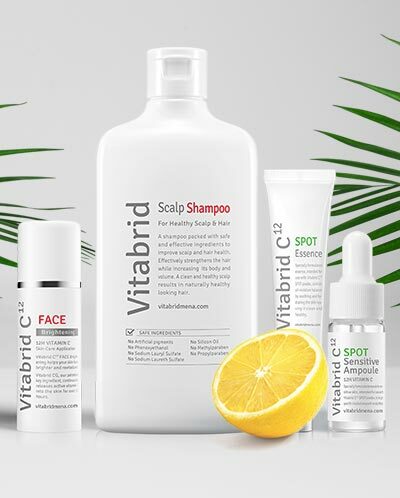 AnswerBecause only 1 percent of orally ingested Vitamin C reaches the skin, if you are looking for a luminous and vibrant complexion, Vitabrid CG is the best option to ensure the best results. However, orally ingested Vitamin C DOES have a wide variety of total body health benefits and should be discussed with your physician to determine if a supplement is right for you. Question Is the container also made in Korea? AnswerAll of our manufacture and packaging is completed in Korea. Question The origin of the ingredients? AnswerThe key ingredient, vitamin C, is from the UK while the minerals and botanicals are sourced from Japan. Question Is it possible to use for all skin types? Even sensitive skin? AnswerVitabrid CG is proven safe for all skin types, and has several options for sensitive skin in our product line. Question Is there a difference in the mechanism between Minoxidil (Rogaine) or Propecia and this product? or What is the difference between this product and Propecia/Minoxidil? AnswerYes there is. Vitabrid CG uses high quality Vitamin C to stimulate collagen production deep inside the dermis, and doesn’t require hormone replacement and its serious side effects and limitations to impact its usage. Gender, pregnancy status and other medical conditions don’t affect who can use the Vitabrid products. And unlike hormone based therapies, hair loss will not immediately resume after stopping. Question Can I use the product with Minoxidil? AnswerWe do not recommend using both together. If you are currently taking Minoxidil or any prescription medications for dermatologic concerns, we strongly advise that you contact your prescriber before starting any new topically applied skincare regimen to prevent unwanted reactions. Question Can I apply it after getting botox? AnswerYes. It can be used on any type of skin at anytime, as recommended by the physician who performed your injections. Question Is it okay to have it on when tanning? AnswerBecause it is a safe vitamin C, it can be applied during tanning; however, depending on the individual’s skin type, it may reduce the effects of tanning. Question What is the shelf life of the product? AnswerThe powder lasts 3 years unopened, 1 year after being opened. For the hair product, it lasts one month after mixing the powder with the tonic. Question Can the HAIR product be used on the FACE (or vice versa)? AnswerWe suggest using HAIR product on the scalp and FACE on the face, because each product comes with target-oriented formulation. Question Though they are all vitamin C products, what is the difference between FACE and HAIR? AnswerEach product’s formulation is optimized for each corresponding skin area. Question After applying the hair product, is it okay to apply heat (hair dryer, perm, etc.)? AnswerNo problem at all, in fact Vitabrid CG will help to prevent further damage from harsh chemicals and exposure while healing. Question If I experience a problem while using the product (side effects), how will the company deal with it? AnswerWhile we pride ourselves on offering a safe and high quality product line, everyone’s complexion reacts differently. In the 3 years since our worldwide launch, we have not received a SINGLE claim or report of an adverse reaction to our formulas. If a patient does experience a reaction, we want to know about it, and will address it on a case by case basis. Question Can people or pets eat it? Is it harmful? Is it okay if it enters the eyes? AnswerWhile our formulas are non toxic, we encourage our customers to use the product exclusively on the skin. Vitabrid CG passed oral toxicity, acute dermal toxicity, ocular irritation, and skin irritation tests. These tests were not conducted on animals. Question Can children use the product? AnswerYes, children can use the product with adult supervision. Our acne formulas are particularly effective on adolescent acne flareups. Question Where is it currently being sold? AnswerAll our available products can be purchased directly from this website. Question What are the sales results in Japan, China, and Korea? AnswerThe product is doing very well. Over $3 Million USD / month in Japan sales alone. Question Are there any problems in exporting to America or Europe (or any license-related question)? AnswerVitabrid C¹² FACE Brightening, Vitabrid C¹² HAIR & Vitabrid Scalp Shampoo have been notified at the CPNP and are ready to be sold in Europe immediately. In US, we have obtained OTC registration for some of our products with the USFDA. Question Are there any distributors (channels for distribution?) in Europe? AnswerNot yet. We are currently looking into candidates for distributorship and have established a Vitabrid EU branch office in Germany.